Don’t forget to quench your thirst with hand-crafted margaritas and specialty cocktails. Cheddar’s scratch kitchen prepares all menu items in the restaurant by hand. You can enjoy all of the favorites for lunch or dinner. Below are the latest Cheddar’s menu prices. Not only is your meal made to order but you can also customize the Cheddar’s gift card. It is simple. Go to the Cheddar’s website, pick an e-gift card design, customize it with your own special message, select a dollar value and type in the recipient’s contact info & email address. The last step is the easiest, press SEND. Within minutes your e-gift card will be delivered. Joining is simple, the benefits are delicious. Sign up is free and only takes a few minutes. Once a member, you will get the latest news on Cheddar’s and be the first to know about any new menu items. Just for signing up you will get a free order of chips and queso. Get all the details on the Cheddar’s official website. Cheddar’s is always searching for team members that enjoy working with the public, have a positive attitude and care about serving quality homemade-style dishes. If that describes you, check out the Career page on the Cheddar’s website to learn more about the company, the culture and the list of current openings. 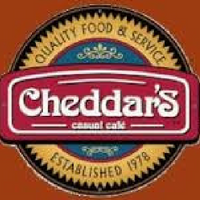 Cheddar’s was founded by Doug Rogers and Aubrey Good in 1979 and located in Arlington, Texas. From the beginning, the commitment has been to serve quality food prepared from scratch. That philosophy has resulted in a concept that currently has 135 locations in 15 states. Today, Cheddar’s is headquartered in Irving, Texas. For more information about Cheddar’s, visit their official website. Find a Cheddar’s near me? Guests can click here, to find the nearest Cheddar’s location. We all went here on Colerain Ave Cincinnati,Ohio to eat for my husband and brother in law birthdays was very disappointed that they didn’t have tables that they could put us together we sat at 5 tables not together there was 18 of us no kids. The services wasn’t good the girl acted like she didn’t want to server us. The manager was rude when we talk to him about poor seating, he said this is it. Will not return to this place of business with anyone. Reason poor server,rude manager,poor seating.. I guess it has to do with the people in a particular Cheddars. The one i have gone to really have great people and yummy food…..
We went to Cheddars in Pooler, Ga. Twice, they have lost the ticket, Each time there was at least 6 people at the table, We waited for 45 minutes, and asked the waitress what was the hole-up. they had lost the ticket so we waited another 30 minutes to get served. I always order the chicken tender platter because the tenders are so good. You get a huge serving too enough for leftovers the following day. Often though I will get take out for my mother and me. We never make it home to eat. They are piping hot and the baked potato has everything on it so we have to eat it while it’s hot! I’ve never had a problem when eating inside. I held a workplace reunion on their patio and had 40 guests. The servers were attentive to our needs. My only complaint was that it was too hot to sit outdoors on that particular day. Other than that the food was great as always. We love Cheddars! Every time we are asked for an idea of a good place to eat, it’s always “CHEDDARS”. Their Bilini Drink is delicious if you would like to have a smooth sweet alcohol beverage! Hamburgers are huge, sooo good! Pot Pie, Catfish, one’ll everything is delicious!!!! Took my grandson Wednesday at just after noon. Was surprised we walked in and seated immediately. We had not been for several years and I couldn’t believe how absolutely delious everything was. He got the shrimp and chicken, said it was great. I got veggie plate and it was more than I could eat, which is saying a lot. I was concerned about the green beans and asked the waiter if they were the bright green that most places give you and he said no they were Kentucky beans cooked to perfection. He was such a sport, I told him we were from WV and knew what beans should be. He was so right, they were the best green beans I’ve ever had. Very good food today- but answer this question- why is a 16 oz draft beer $3.99???? I think $4.00 for one draft beer –short as I was told- is totally ridiculous!!!! !